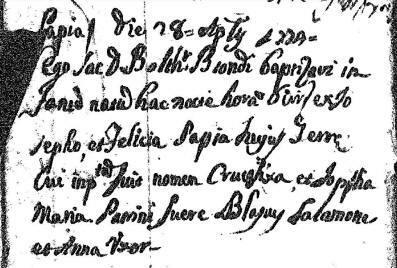 My GGGG-grandmother's name was given on her 1774 baptism record as Crucifissa Giuseppa Maria Papia. Her father's name was given as Joseph (Giuseppe) Papia, and her mother was identified as Felicia, no surname given. Civil death records are missing for 1831 and 1832. Church records exist, but are frayed and damaged. Both the index of deaths and the actual record was used to confirm the information for Crucifissa Papia. Her first name is given here as Crucifixa, and her surname is shown as Papio. 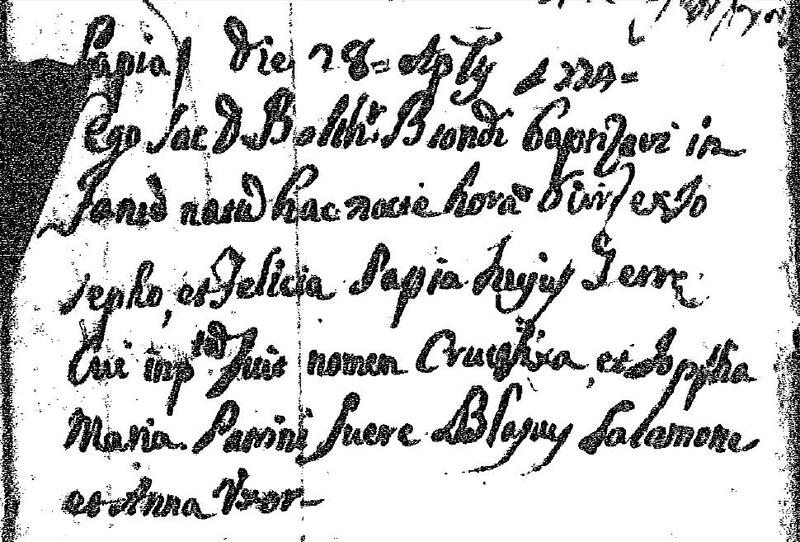 The death record has an omission, in that it says she was the daughter of the late Pietro, but she was actually the wife of the late Pietro Lattuca and of the late Leonardo Marino. Her father, as shown on her baptism, was Giuseppe Papia. With her second husband Leonardo, she had a daughter Gaetana who married Calogero Territo. Vincenzo Territo (Jimmy Treat) of Robertsdale, Pennsylvania is Crocifissa's great-great grandson. Crocifissa Papio filia defunctorum Petri, et Felicia uxor qm Le . . . .
di Marino ann 60 extremis munita Sacramentis obbiit . . . . . . .
corpus deletatam fuit in Oratoriae Animarae Purgatoriae . . . . .
Crocifissa Papio dghter of the late Pietro [sic] & Felicia, wife of the lateLe . do Marino. Age 60, at the end, armed with the Sacraments, died . . .
her body was taken to the Prayer Chapel for the Souls in Purgatory . [by Priest] . . Petix. There she was buried. Angelo Marino: about 1813 - ?